Koch Industries Success Story | Team Industries | TEAM Industries Inc.
Based in Wichita, KS, Koch Industries, Inc. is one of the largest private companies in America with annual revenues of about $115 billion. Koch Ag & Energy Solutions manufactures, markets and distributes more than 13 million metric tons of fertilizer products annually. Team worked with Koch Ag & Energy to expand its Enid, OK, Nitrogen Plant. 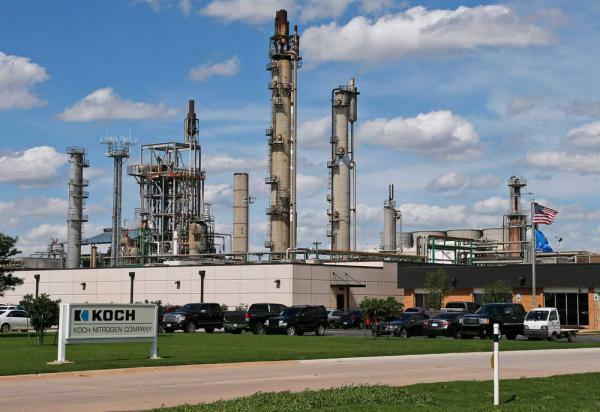 The Koch Nitrogen facility in Enid, OK, is one of the largest fertilizer production plants in North America, producing ammonia, UAN (liquid fertilizer) and granular urea. Koch has invested more than $100 million into the facility, including the construction of a 10,000 sq. ft. control facility in 2011; the company is in the process of improvements to existing processes and construction of a new plant at this location.